The paper is written under the auspices of the project 47010 supported by the Ministry of Education and Science, Republic of Serbia. 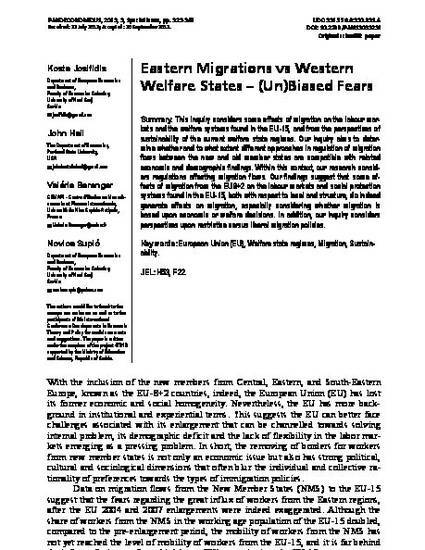 This inquiry considers some effects of migration on the labour markets and the welfare systems found in the EU-15, and from the perspectives of sustainability of the current welfare state regimes. Our inquiry aims to determine whether and to what extent different approaches in regulation of migration flows between the new and old member states are compatible with related economic and demographic findings. Within this context, our research considers regulations affecting migration flows. Our findings suggest that some effects of migration from the EU8+2 on the labour markets and social protection systems found in the EU-15, both with respect to level and structure, do indeed generate effects on migration, especially considering whether migration is based upon economic or welfare decisions. In addition, our inquiry considers perspectives upon restrictive versus liberal migration policies.